"I love summer because all of the really terrific fruits are in season and not too expensive. I created this salad to trick my kids into eating their fruit. This salad can be served as a side dish or a light, refreshing desert." Gently toss the watermelon, peach, nectarine, plum, blueberries, and grapes together in a large bowl. 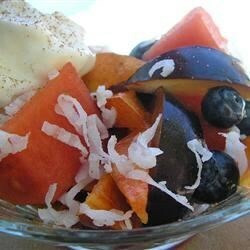 Sprinkle the coconut and cinnamon over the fruit mixture and lightly stir to mix. Cover the bowl with plastic wrap and chill in refrigerator at least 1 hour before serving. Top with whipped topping as desired. I am making this salad for the second time in one week. It is SO delicious that I am taking it to a Birthday Breakfast this morning. Try this recipe. You'll be glad you did. Very yummy. I doubled the whipped topping, only because we REALLY like whipped topping. I also toasted my coconut and sprinkled it over each bowl of salad. We loved this. Quite refreshing. i love the addition of the coconut! great!! I love how fresh this is for summer. The coconut gives it the perfect amount of sweetness.